Oahu – The Gathering Island and The Most Popular Things To Do In Hawaii. Each Hawaiian island is different because of their geological ages. Volcanoes build and collapse, break apart and erode. Of the five major inhabited islands, Oahu is the second oldest of the main chain. It has a very unique shape separating into north, southeast and west sides. This unique shape made it one of the most desirable in ancient times as well as today for its safe harbors, expansive lagoons, soaring mountain ranges, and stunning beaches and surf. For nearly 1000 years Polynesians have inhabited this island and built a civilization that sustainably supported approximately 300,000 people at the time of its discovery in 1779. King Kamehameha conquered Oahu in 1795 on his way to uniting the archipelago under one ruler. The battle raged across the beaches and plains of Waikiki and into the mountains were the Oahu army met its demise at the 1000’ cliffs of Nu’uanu Pali. Today the Nu’uanu Pali Lookout is one of the most scenic overlooks in all of Hawaii. Honolulu and its harbor became an essential port of call for merchant ships from the early 1800s thru to today. The city became the capital of the Kingdom of Hawaii in 1850, and eventually, Honolulu would usher in the modern age with a grand palace (Iolani Palace), a world-recognized government and constitutional monarchy, and a highly strategic naval station (Pearl Harbor). Today Oahu is the most popular destination of all the Hawaiian Islands which saw 5.7 million of the 9.3 million visitors who arrived in the entire state in 2017. This may seem like a lot of people and crowds, but it’s still quite easy to get around the island with three major highways crisscrossing and circling the island. We are here to help you navigate through all there is to see and do on the beautiful island of Oahu. From luaus and dinner shows to land, sea and air tours we know the best companies to go with that will bring you and your family stories to cherish for years to come at a price to fit every budget! Explore the famed Kualoa ranch on ATV, horseback and more. Check out their hidden island too as well as Jurassic Valley!. Learn more now. You want to go underwater when you are in Hawaii. The reefs are beautiful and the turtles are magical. Snorkeling with turtles is the most requested thing to do in Hawaiiʻs waters. We also got great surfing, kayaking, canoeing, stand up paddle boarding and so much more too. You will love being in the Ocean here in Hawaii. The landscape of Oahu is formed by volcanoes, wind, and water which makes every view dramatic. Take tours across the island to see cliffs and mountains dominate the skyline while you get immersed into the rich history, culture, and beauty around every corner. Go sightseeing on Oahu to the North Shore, Dole Plantation, Pearl Harbor, Polynesian Cultural Center, Farms & so much more. Explore Oahu with our vacation package. See the best of Oahu with visits to Pearl Harbor, a luau, grand circle island tour and so much more. Book your tour today. As far as city borders go, Honolulu is the largest city in the world. This is because the state constitution proclaims that any island or islet not named to a county belongs to Honolulu. The Hawaiian archipelago stretches to Midway Atoll in the northwest Hawaiian Islands making the borders of Honolulu some 1500 miles long! Honolulu is the nations 11th largest metropolitan area. 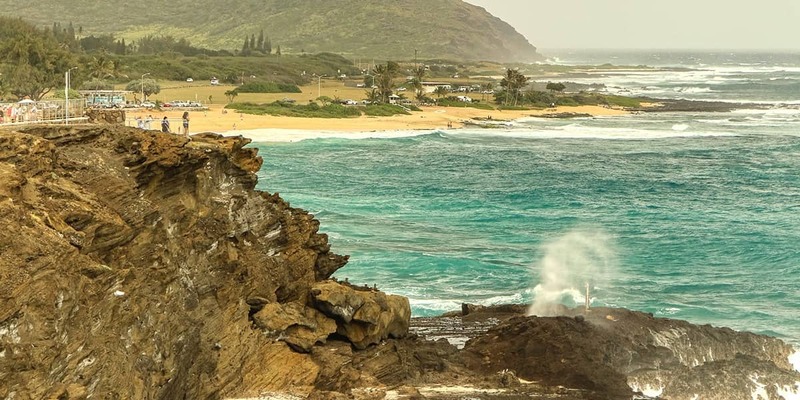 More than 100 world renown beaches ring Oahu. Iolani Palace is the only royal palace in the United States. The Dole Pineapple Plantation once produced nearly ¾ of the world’s canned pineapples. The world’s largest wind generator is on Oahu. It’s two blades are 400 feet long and the windmill’s tower stands twenty stories high. Helicopter tours are one of the most popular ways to see the island of Oahu. Flying over Waikiki, Pearl Harbor and the north shore gives visitors a breathtaking view of this beautiful islands towering cliffs and unique volcanic craters such as Diamondhead and Koko Head. Be sure to book an air tour while on Oahu and you’ll be sure to come back with some memorable photos. Just remember to bring the widest camera lens you have…there’s a lot to take in from the air! Adventure is everywhere on Oahu. Hikes to Diamond head, crazy cool ziplines, horseback riding and ATV tours thru Jurassic Park are just a few of the many activities you can only experience here in Hawaii. If your an adventurous traveler Oahu has plenty to offer and we are here to help you find the perfect adventure tour at a great price! The Hawaiian luau is an iconic celebration of polynesian culture that visitors to the islands have enjoyed since the mid 1800’s. Today the variety of shows and locations throughout Oahu is amazing with something for every kind of traveler and budget. Check out these great luaus or read more about this history of these celebrations that are now part of an everyoneʻs Hawaiian vacation. Aloha Nui Loa! Oahu is the most popularly visited island in Hawaii and one of the reasons for this is the wonderful amount excellent shows and entertainment to choose from. Take in a polynesian inspired magic show, a sunset dinner cruise while viewing a Friday night fireworks show or enjoy a review of Elvis Presley and the music from his various Hawaii movies! There so much here you could return time and again and never see them all! That’s why we’re here to help you narrow it down by sharing our favorite shows on Oahu below! There are a number of great tours to not only see Pearl Harbor but the rest of Oahu too. No vacation to Oahu is complete without a visit to the USS Arizona Memorial and the USS Battleship Missouri. After that, you can visit the historic city of Honolulu or you can choose something a little different. See all the great options to experience Pearl Harbor the way you want. Prefer to get a more personal tour? Book our Oahu Private Tour by Jeep, SUV, or Mini Coach and you’ll get a private car with a driver for you and your party, plus the undivided attention of your expert tour guide. You have three vehicle options to choose from depending on the size of our party. Choose a Jeep for parties of up to 3 guests. Choose an SUV for parties of up to 6 guests. If you have a larger party (up to 12 guests) choose our mini-coach option. We recommend this tour for small parties or just for a couple who wants a more personalized experience. Book today and have an unforgettable experience! A personalized tour experience with a private car and driver. Tickets to Pearl Harbor and access to the USS Arizona Memorial and Pearl Harbor Visitor Center. Create your own itinerary or follow your guide’s recommendations. Complimentary bottled water and juice for you to enjoy throughout the day. We have a ton of add-ons that will make your day even more special. Did you want to go to dinner, see a sunrise, go to a special cultural place, make a proposal, celebrate an anniversary or whatever you want? We know Oahu and we can help you plan the most memorable experience, hitting all your bucket list items. We can hold your baggage securely all day long. Going from your Hotel to Cruise Ship to Airport? We can help you make your first and last days on Maui the very best you can experience! Let us arrange the flights, transportation, activities, and accommodations for your trip. Knowing which days to go where and when makes all the difference. Give us a call and ask, we can get you set up with all the best tours, activities and more! Are you staying on Kauai, Maui or the Big island and really want to see and experience Oahu? There are opportunities for you to do that no matter where in Hawaii you are staying. Take a day tour and experience the best of Oahu. The Hawaii Movie Tours® on Kauaʻi is a unique opportunity to experience the island through the filmmaker’s lens on an incredible guided tour of Kauaʻi’s famous movie locations. What are the most popular things to do in Oahu? Pay your respects at Pearl Harbor, sunbathe on Waikiki Beach, visit north shore beaches and watch the surfers (or sunset), visit Waimea Canyon and swim under the waterfall and visit the Polynesian Cultural Center. Snorkeling at Hanauma Bay and stopping at the blowhole on the west side is also popular. What is Oahu famous for? Oahu is known as the “gathering place” and is the third largest of the four main islands. It is the most populated of all the islands with over 1 million residents. It is home to Pearl Harbor, which was attacked by the Japanese in 1941. 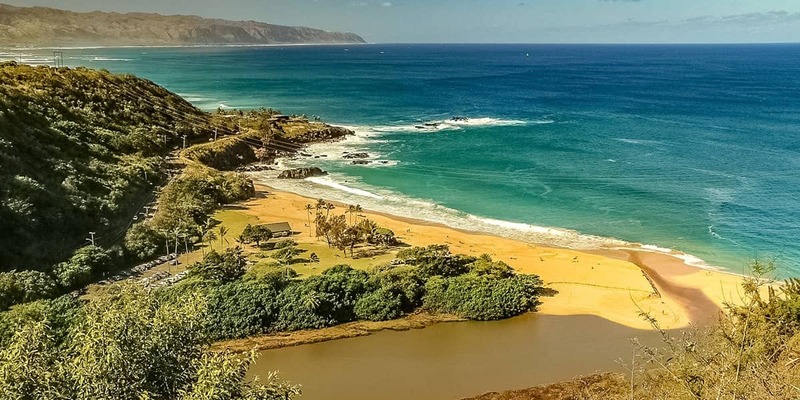 The north shore of the island has world famous surf spots featuring some of the largest waves ever ridden (in the winter months) at Waimea Bay, Banzai Pipeline and Sunset beach. Are Honolulu and Waikiki the same? Waikiki is a neighborhood within the city of Honolulu. It fronts the coastline (beach) of downtown Honolulu. How big is the island of Oahu? Oahu is 44 miles long and 30 miles wide. It is the third largest island and is 112 miles around. From Honolulu it takes around 40 minutes to get to the north shore or to the west side of the island through the mid island Pali tunnel (depending on traffic). What is the difference between Leeward and Windward sides of the island? The leeward side of the island is the side protected from the prevailing northeastern trade winds and is typically the drier side. The windward side (north and eastern side) is exposed to the prevailing winds and thus is the wetter side which produces lush rainforests and large surf.